Fest is a premium Joomla 3.0 Template from Gavick Pro. I’ve never seen a Joomla 3.0 template like this one. This is very professional and unique Joomla 3.0 Template. 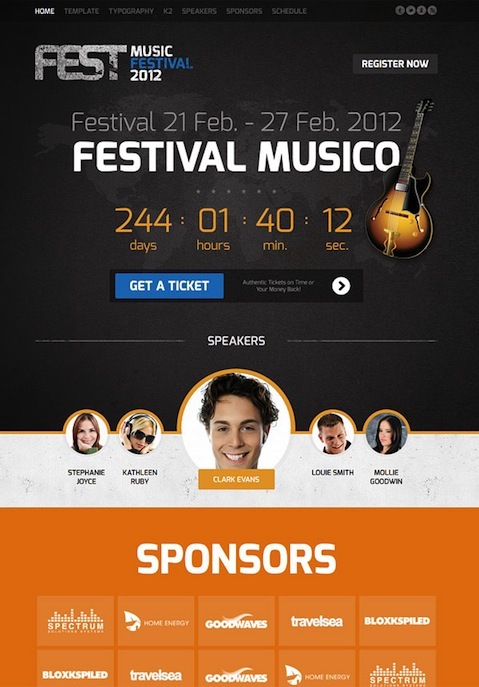 Fest will help you create an events listing website for a music festival website or a movie events website. It features a count down by days and time to the event, Register button, purchase tickets button, rotating images of key speakers/singers, sponsors, event schedule listing, add content to the site, and tons more. Click here to see more features of Fest. Fully compatible with all modern browser like Firefox, Chrome, Safari, Opera and Internet Explorer 8 and 9. Quick start package that allows you to install Joomla 3.0 and the template, component, modules and plugins fast and easily. Gavick Pro is a premium Joomla 3.0 Templates provider. They have professional Joomla 2.5 templates and Joomla 3.0 Templates to create a business website, eCommerce website, news website, events website and more.